The New Look and Energy Savings Capacity of Storage Tank Water Heaters! As of April 16, 2015, conventional gas and electric storage tank water heaters will no longer be manufactured in the US. Once existing supplies are gone, you’ll have one 3 high-efficiency replacement models to choose from. Here’s a brief description of each type. 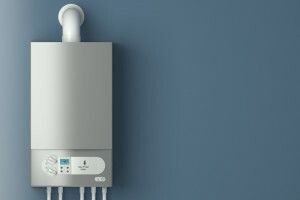 A gas condensing water heater delivers greater energy efficiencies than conventional gas storage tank models. When compared to a conventional gas storage tank model, a gas condensing unit retains more and wastes less gas to heat your water. That, in turn, reduces the amount of gas needed to produce the same amount of hot water. With a gas condensing water heater, you can expect to save about $100 per year to heat your water for an average family of four. With less gas being vented outdoors, you’ll also be helping to reduce greenhouse gas emissions. These high efficiency models are like a refrigerator working in reverse. A refrigerator, on one hand, removes heat from itself and expels that heat into the surrounding air. Conversely, the heat pump component of an electric hybrid water extracts heat from the air around the unit and uses it to help heat the water. While these work in all climates, the energy savings are more pronounced when and where warmer outdoor temperatures prevail. Equally important, a family of 3 can expect, on average, reduce its annual electricity bill by about $370 when converting from a standard electric storage tank water heater to an electric hybrid model. Click here to learn more. How do they work? Once you turn on a hot water faucet or your dishwasher, for example, a valve opens that sends cold water into the system’s heat exchanger where it’s instantly heated and directed to the source. 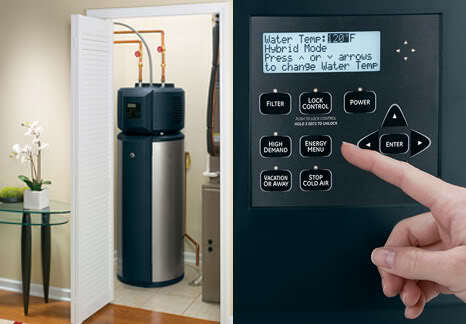 To learn more about high efficiency water heaters, and which type might be best for your family and budget, contact Boden today.